And then I found a set on craigslist I got for $100 with rings and bash guard. 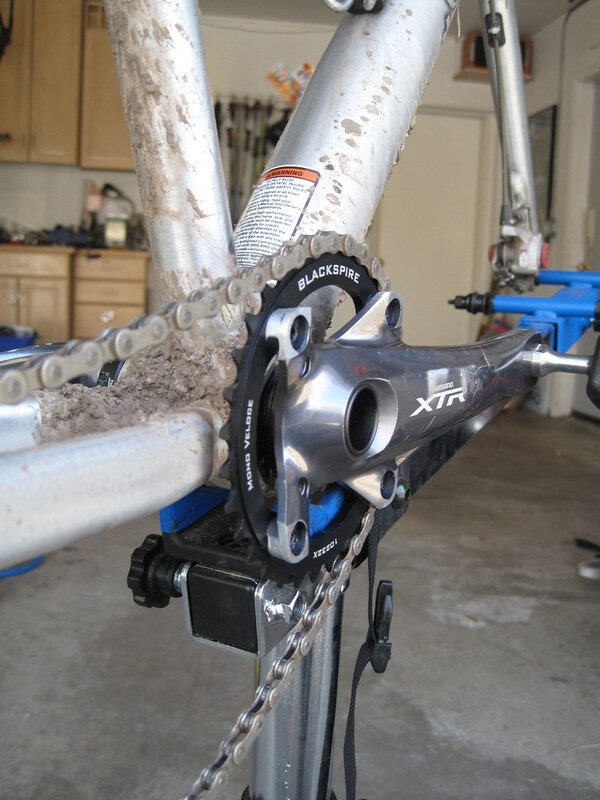 And will order a King bb since it can be greased in place (used to love the WTB headsets, bbs and hubs!). 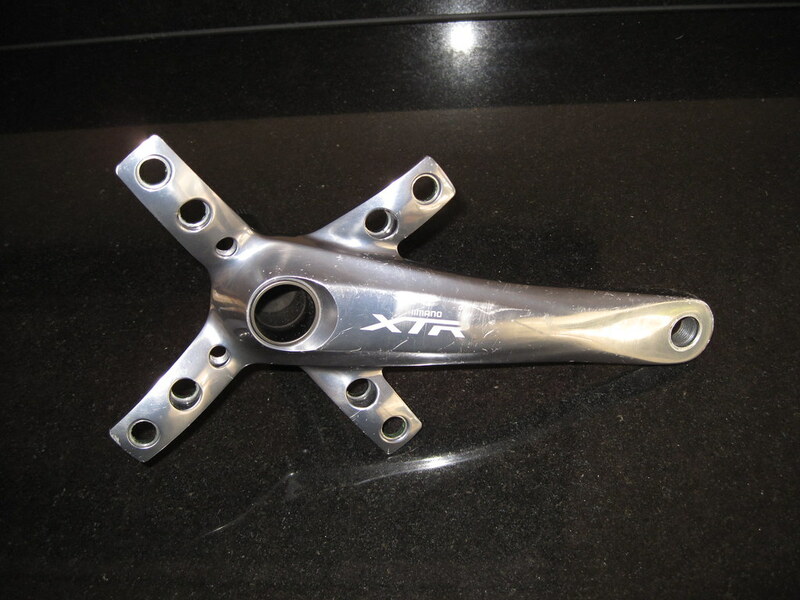 And I might get around to refinishing the whole crank like Jeff does, but for now, I can ride the mtb this weekend! Cannot wait for the powertap to arrive! Saturday was my second race of the season. Probably my 10th mass start race in 2-3 years. So, how’d I do? 6th. Out of approximately 100. Not bad. Really, I know that. In reality I am probably a Rouleur, not the fastest pure sprinter, but if I am there in the end – I stand a chance. So I didn’t work. I stayed at the front, but not ON the front. I sat behind Clark, but didn’t pull through. I got bumped into the corner and repeatedly pushed in towards the rocks due to the southeast wind. And I started pushing back. I didn’t give an inch anymore. I knew that I could stick my nose into the wind and not be left for the rest of the race. So I watched. And I waited. And I pointed out the moves to those on the sharp end of the stick to keep things together. And things generally did stay together. At the bell, someone’s was moving off the front, stood up and snapped a chain. Visions of last year’s collarbone flashed in my head, but he rode it out and we all settled back in by turn 1. Things seemed to roll slow on the backside as people tried to stay out of the wind. In the chicane, Justin rolled off the front. I wanted to roll with him but was too far away and couldn’t make it. Into the last curve came into the corner in ~9-10th… I cannot believe how WIDE some feel they have to take it. I probably made 2-3 spots on the exit of the corner. We started to wind it up, moved past one rider and felt another move past me. I kept holding something in reserve. It is a long drag to the finish line and that is only the second sprint I have contested this year. I kept holding onto something because I was SURE, dead sure that the freight train was coming throught… that the pack was rolling up on me and soon to be past me and I needed something left to jump onto it if I were to stay in the top 10. But the train never came. Hell, maybe I was the train. Dunno, but ended up a happy 6th place. I hadn’t had to check in with an official to check my placing and honestly, that alone is a pretty good feeling. So, what about the data? Well, there is it… 45 minutes @ 272w Pnorm, 241w Pave. Peak power of 1002w. 33.67mph in the sprint. A high VI, low Pave. Cadence right where I would expect it. Can you see it? There it is in the green line. I have been doing this for a while. Perhaps not as successfully as I would like, but I have learned a thing or two. Like how to hide in a pack. And how to not work. That is an awful lot of coasting in there. It also bears out two of my philosophies of my coaching. The first is that consistency in training… or in more modern terms, maintaining a CTL gives you the ability to race well. With the ride there and home @ 3hrs and 219TSS, without consistency in training or a descent CTL, I would have been shelled. Racing should not be your hardest workout. Now, think about that for a second. Your race should not be harder than your hard workouts during the week. Now, there are exceptions to that – like peaking for an event, or other times when racing tactics dictate outcomes and workloads… but in general, for the season-long road racer, this holds true. For example, from this file: 45 mins @ 272w? No problem – this year I have already spend several 1hr blocks @ or above 280-300w for the Pave. Those sessions felt (and were) harder than saturday’s race. And the finish, was I holding back? 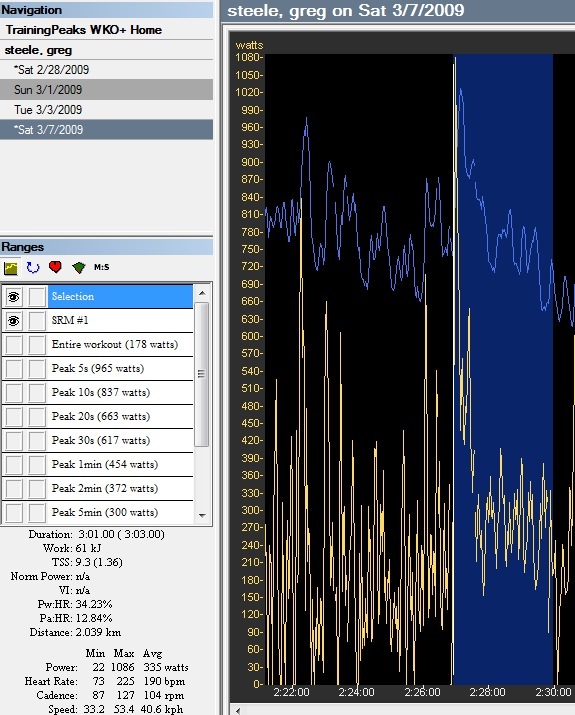 Well, peak power was 1002w, now granted it was after 43 minutes of hard tempo riding. But in the past two weeks I have been doing some testing. 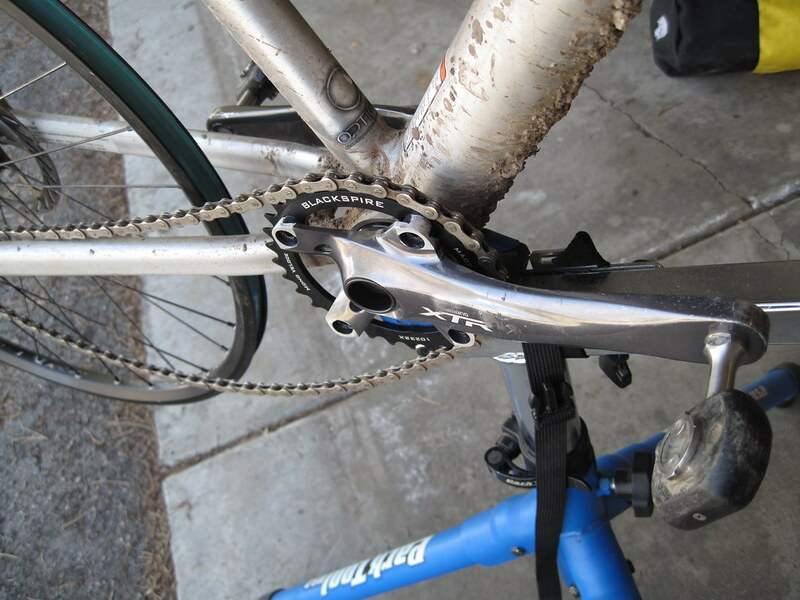 One of those tests was a pedal test where I was doing Force – Velocity testing to determine if there were differences between two sets of pedals (more on that later). During those tests, I did 11 sprints. All eleven of them broke 1100w. So, the sprint was easier than training. The entire race was easier than what I was capable of performing. I was able to be competitive because my training was harder than the race. Many have said bike racing is kinda like playing chess while running a marathon. How can you play the chess part well if staying with the group has you on the rivet? There is a time for pushing the limits in the race, for performing a PB in 3, 5 of even 1hr power markers in racing. But if you are racing all season as a road racer, it shouldn’t be in your “c” races. Ironcially (? ), this result places me in 7th overall in the series! Here is to hoping that I can maintain a level of performance and improve my results for the year. This week after being so close to Justin as he came across the line with his arms in the air…today, tonight, I can taste it. I can see it. And it will happen this season. So with some aprehension (and excitment) that I rolled out solo to the RMR. The huge puddle on the back side of the course looked COLD and I was happy to learn that we were racing inside the (nascar for the non-locals) oval. I told myself, like my last post, that the goal was to finish with the group… but (IMHO) the oval makes that easier. I sat on the line, saying out loud, don’ t attack, sit in, finish. And for about 37 minutes, that worked well. Then with two riders off the front, and two more getting reeled back in by Dru, the inner demon’s exposed themselves and bam! I was gone. I spent 3 minutes in no man’s land. Put about half a lap on the field, never caught the riders in the front. I pulled the plug in an effort to get a decent sprint in on the line (and with hopes that they would pull it back together after wrapping me up – which didn’t happen). I got a little boxed in at the finish and don’t have the killer sprint instinct honed as of yet, but it felt good, and starting a year with a ~15th place is good for so much time off. Numbers matched feeling – 258w Pnorm for the 45 minutes which explains why it felt easy. Tack on the hour there and the return makes for a nice 3:06 ride time and 207TSS. The finest things I have ever slipped onto my feet. I cannot wait to use them for more than walking in the carpeted basement. Road season is upon me. How can I tell? Tonight in an unplanned adventure, the CX bike, and three sets of wheels were stripped of cassettes (11-23, 11-25 and 11-25) and duly sent to the basement for the remainder of the season until September, that is. Cassettes cleaned and one 11-25 found it’s way to the 202s. The 11-23 found it’s way to the 808s. And the other 11-25 made it’s way over to the training tubies. 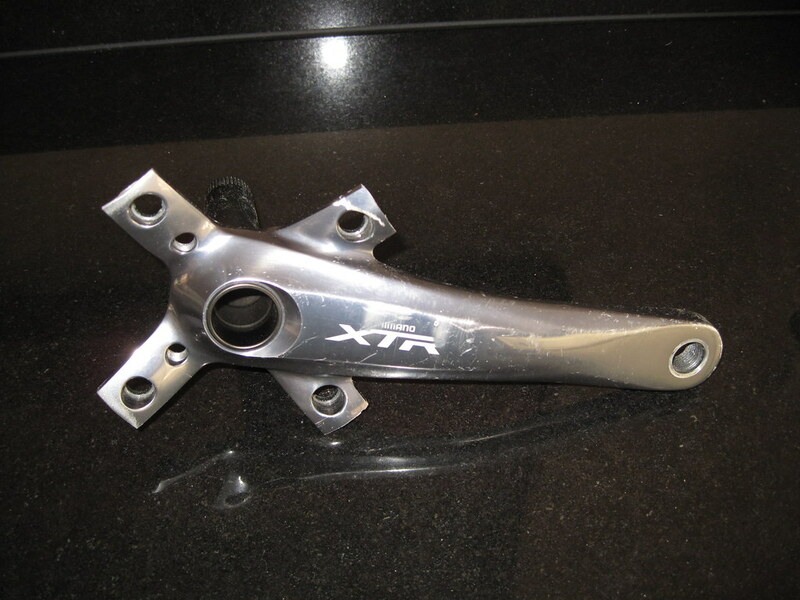 Lori’s mtb (despite it’s perpetual hibernation) recieved my old xtr wheels that I decided not to sell. Maybe I can teach her to “ride light” but that would involve her getting ON the mtb again, and between you and me, I don’t see that happening. 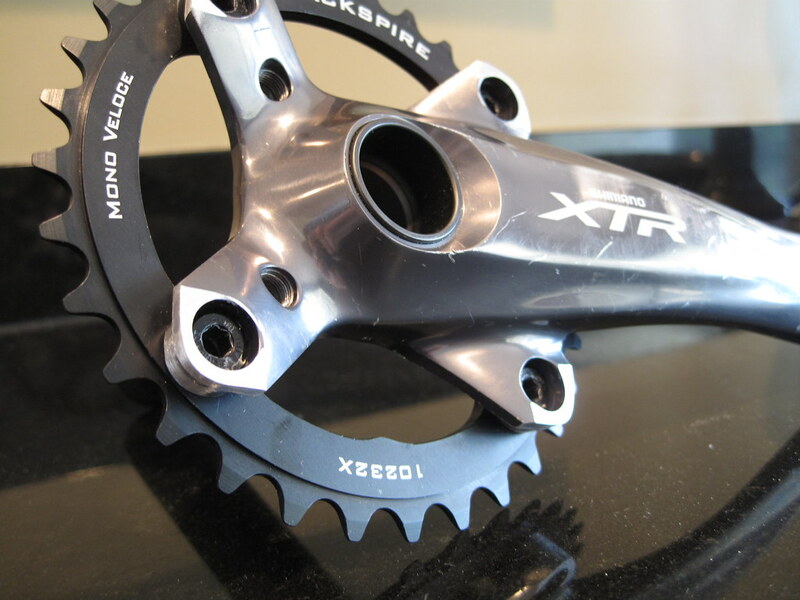 The testing, adjustable SRM crankarms came off and the stock 172.5s are back on. 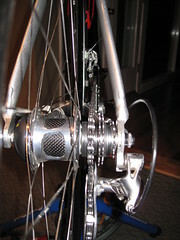 Then that SRM got 53/38 rings and (after a bb swap and front der swap) found it’s way to the merlin. The merlin got a clean up and stripped of fenders, pciv mount etc and is now in true FLAHUTE-form. I tested all the zipp glue jobs and threw the 808s on the soloist and ran around the block on it…Wow. I forgot how that thing rolls. Effortless and fast. Maybe I WILL take it out for the first race next saturday. Unless it is raining…then it is Flahite bike all the way. It has 4 more weeks of duty until HOTN before it sees retirement for the season as well. Spring classics are on my mind. I haven’t written much lately. I have just been wrangling the family, trying to ride and find some form. But I have to say, for the first time I am pretty excited to race my bike. I haven’t been doing it much in the past few years. Sure a few Saltairs without much passion. Sure I have be fixated on the technical aspects of the sport, from equipment testing and selection to coaching and finding that thin edge out there for others. Maybe it was the clothing. Maybe for the first time, not having to worry about anybody else and what a team or teammate things or wants to do is what has brought it back for me. But it is there for me and pretty cathartic. I have ridden the TT bike 2 days this week already. I am already thinking of pulling the slc-sl outta the rafters and getting it ready to fly. The fenders are dangerously close to coming off the winter bike if the weather would offer to cooperate and with The Hell of the North on the horizon, I can see wrapping up the use of the ti bike for the season. It’s funny, how many times have I said to clients to identify simple, achievable goals. Go to each race with SOMETHING that you want to accomplish. And I can see that for myself today. I do plan to go to the first few RMRs and see where fitness is. Goals for the first 3-4 of these? Don’t be stupid, don’t be on the front and just finish with the pack. Simple goal, be pack fodder. But it has probably been 3-4 years since I started a season and raced throughout the season from start to finish. So, I don’t want to or expect to stand out. I just want to be part of it. HotN will come and while not a peak race or anything, I would like to do well in it. Maybe a step above pack fodder. Tour of the Depot – a local stage race with a TT, yeah, I would like to do well there. But with a son’s birthday on the 9th and Easter on sunday, who knows if that will happen. State TT – I would like a PB for the 40k. Beyond that, there is a hut trip in the plans, Tour of Bozeman looks like fun and if any or all of the above goes well, there is always the Record Challenge. I can almost think of myself as a bike racer again…almost. In the off-season, I have the chance to do some skate skiing, some downhill and other fun activities. Of course, some of these do not provide the opportunity for using a power meter to record and quantify. Some time ago on the wattage list, there was discussion about Hunter Allen’s Pez interview and his desire to incorporate ventilation recording in with power and other data. That brought me back to using my Suunto T6 on a regular basis. One thing I like about using it in conjunction with a powermeter is the ability to record altitude gained (which I track) without having a GPS. One thing I dislike about it (and moving to an SRM wireless would solve this) is the multiple recording devices and/or HR straps. 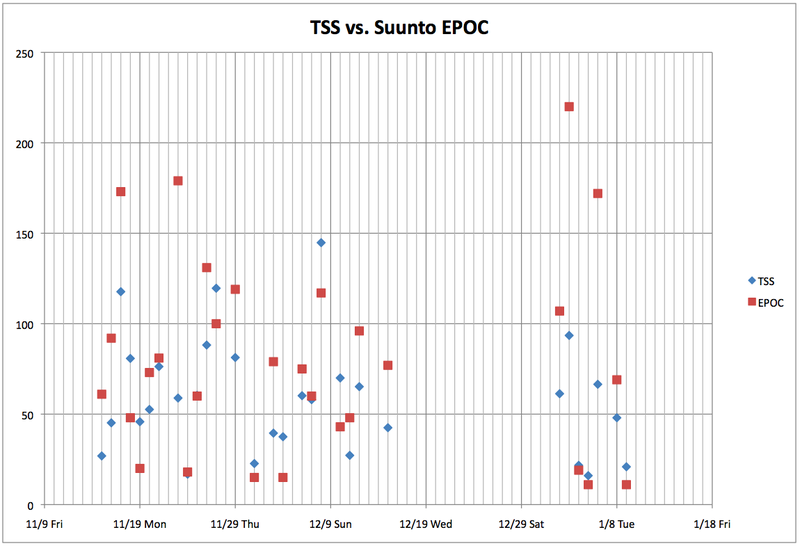 All that aside, I have been tracking the Suunto for a bit, and using a slice of off-season data, I wanted to see if there were any correlation to the Suunto Training Effect and/or EPOC values to TSS. 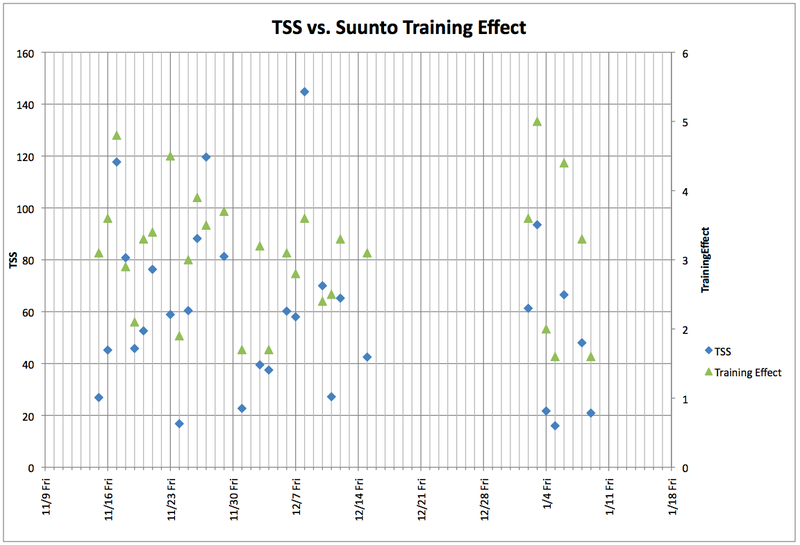 This would be a nice to have tool to use to approximate the TSS for non-power based workouts. 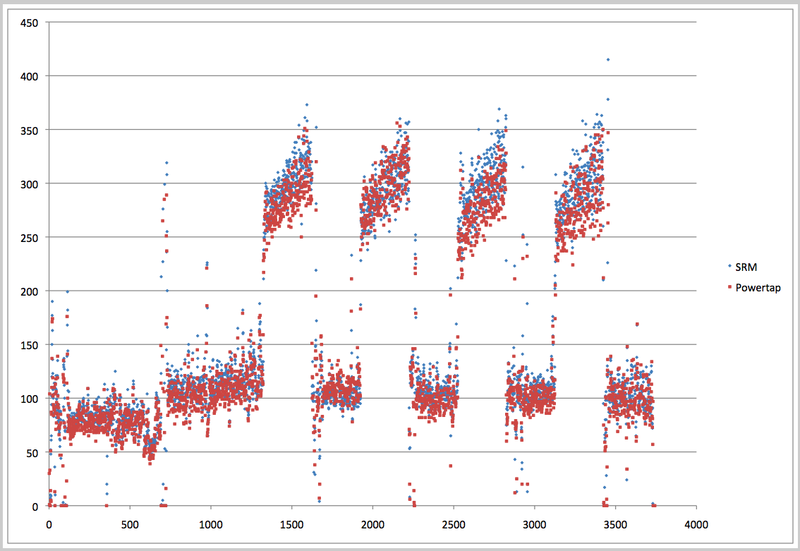 But in the meantime, last night I did some data collection on Chainring Comparison v1.1. You can follow more on it in the forum.